Please select one options from below priced per person. Long Beach Charter Yacht in a custom-designed 77′ luxurious and spacious yacht for your every want and need. Up to 50 guests will feel welcomed immediately as they board, entering the large and elegantly appointed salon, which includes a baby grand piano, fully appointed bar, classically upholstered sofas, beautiful carpet and convenient galley and serving area. From a wide, curving Euro-style brass and wood carpeted staircase inside the salon, guests access the upper deck for seated dining, meetings or entertainment and dancing. The elegant gold chivari chairs accommodate up to 120 seated comfortably at tables. This deck enjoys panoramic window views with a section capable of letting in refreshing ocean breezes. Notable on the upper deck is a secluded VIP / Admiralty area, an intimate setting for special private moments. 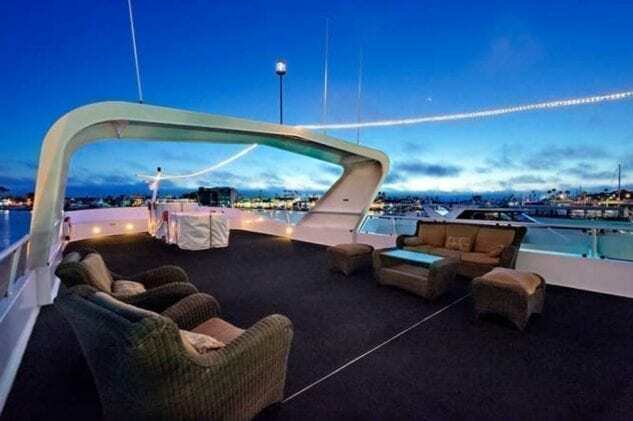 This Long Beach charter yacht is available for charter in Long Beach, Los Angeles, and Catalina Island. This historic yacht is perfect for a harbor or coastal cruise. This 50-passenger 77 foot luxury yacht is perfect for yacht charters in Newport Beach, Los Angeles, San Diego, and Catalina Island. Take a look at Luxury Liners’ itineraries and destinations with our boat rental locations for ideas for your yacht charter! She is currently available for full day (8 hours) rentals. Price includes yacht, captain, crew, and fuel.